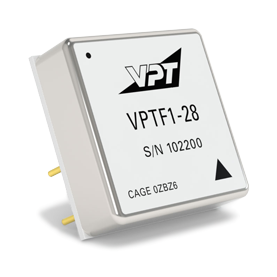 VPTF1-28 EMI Filter | VPT, Inc. The VPTF1-28 EMI filter filters conducted emissions of two VPT5-2800S or one VPT15-2800S series DC-DC converters. Six-sided metal packaging ensures excellent EMI shielding.